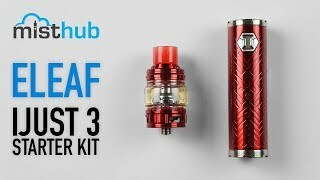 The Eleaf iJust 3 brings the Power, the Look, and most importantly a Monster Tank! Flush tank and battery design, the iJust 3 is arguably the total package when it comes to a great tube mod style vape. Blasting out 80watts with a full battery, the Ello tank delivers big clouds thanks to its multi-hole coil systems. The taste of any heavy VG juice will be squeezed out with this one. Serving as the long awaited refresh to the already successful iJust 2, the all-new Eleaf iJust 3 is rearing to knock our socks off with an even bolder new look and cloud-billowing performance that dares to rival the output of its mechanical-inspired roots. Released as a tube-style mod like the rest of its predecessors in the iJust series, the iJust 3 kit is taking its top-notch portability and vaping performance to the masses with it's easy to use setup and operation, and a dazzling array of colorways to choose from. Now let's take a closer look at the mod and the included ELLO Duro tank and see what makes it one of the potential winners of this year. Probably one of the most notable revisions to the Eleaf iJust 3 is the inclusion of a whole new series of acrylic colorways designed to impress tired old eyes that have grown weary of the typical metal alloy designs that have been flooding the market like no one's business. Unlike the high-gloss finishes that come standard with most metal alloy builds, the acrylic colorways offer a very pleasant satin finish that doesn't only feel great to hold in hand, but also offers the advantage of being fingerprint resistant so that the finish stays great-looking for even longer. The iJust 3 also brings great tidings to FIFA World Cup fans as being one of the few kits that are offered in limited edition World Cup designs. The standard bulb-type glass chamber is now replaced with a football-shaped spherical chamber and a unique world cup trophy embossed design on the main body of the device, letting fans further relish in the spirit of the World Cup. An intelligent LED light indicator effectively eliminates the need of an actual display and is subtly placed behind a quick firing hexagonal firing button which illuminates with a healthy glow whenever pressed. The threading on the 510 connection is impeccable, constructed out of solid stainless steel and machined to near perfection. Threading on the included ELLO Duro tank or your atomizer of choice will be a hassle-free experience without any annoying burrs that would only result in a grating and crunchy and imperfect installation of the atomizer. With a 510 port that accommodates tanks or RDAs up to 25mm in diameter without any overhang, you can surely bet that the Eleaf iJust 3 was made for performance, giving ample room for large chambered atomizers to sit comfortably on top of the mod. Also, the ELLO Duro tank that comes with the kit isn't just your average cloud-chucker; it's fully compatible with the HW coil series. Plainly speaking, the mesh coil system used by the included HW-N and HW-M coils is a class winner when it comes to e-liquid vaporization. More vapor is produced with each puff and the increased surface area of vaporization ensures that boatloads of flavor are being produced whenever you hit that firing button. The 14mm wide bore drip tip that comes with the kit definitely makes it easier for all that vapor to be inhaled without making the entire vaping experience feel too intense. The 3 airflow slots at the bottom of the tank are also fully adjustable, giving you full control over each puff. Airflow can be set to restrictive or wide open resulting in a warm and dense puff, or a cool and airy inhale depending on your preference. You'll also be glad to know that the airflow is smooth and consistent without being whistly or turbulent. Each kit comes with two glass chambers: a standard 2ml chamber that sits flush with the rest of the mod, and an expanded bubble tank that holds up to 6.5ml of e-liquid. The iJust 3 kit doesn't cut any corners either when it comes to the refilling method as the top cap features a push to open feature which makes refilling the tank on the go an easy endeavor, eliminating the need to unscrew the top cap whenever you need to top up the contents of your tank. If you're holding the idea in your head that the simplicity of the iJust 3 comes with the disadvantage of it being less powerful than larger and more complicated box mods, think again. The Eleaf iJust 3 powers up to a full 80 watts, so you'll never feel lacking for more vapor or flavor. The internal 3000mAh battery does a great job of keeping the mod powered up for the entire day while the easy-to-use micro USB charging port makes the iJust 3 just a step away from reaching it's full vaping potential once again. If you're a true World Cup aficionado, picking up the Eleaf iJust 3 should be a no-brainer. The fact that it offers world-class performance in its size class and manages to look spectacular while doing so is just the icing on top of this already impressive cake. The ELLO Duro manages to match the muscle of most 3rd party atomizers available in the market with its smooth airflow design and massive vaporization headroom making it a class leader in terms of kit tanks.